I've mentioned before that my sister is in the military. She's currently in the middle of a 9-month deployment and asked me if she could put together a guest post for my blog to tell people what a typical day looks like in the Navy. (Sadly, there are no Village People...) I hope you enjoy her post! 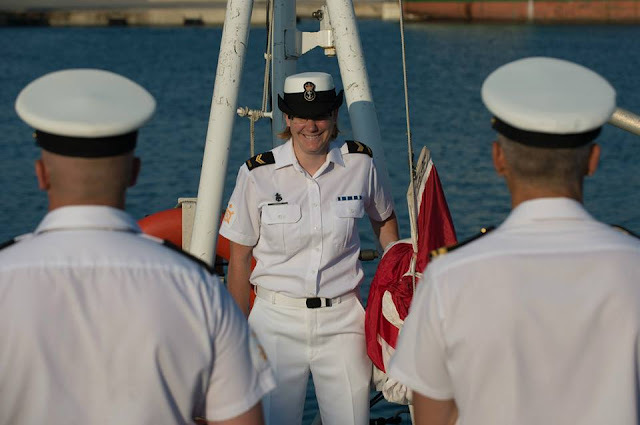 My name is Amanda Cassidy, I have been in the Royal Canadian Navy for 7 years and am currently deployed on HMCS Winnipeg. My rank is Leading Seaman, and I am a Sonar Operator. I hunt for submarines using either a system like a big microphone in the water and listening for noise in the water like engines or by putting noise in the water ourselves and listening for the echo to come back. Kind of like in the movie The Hunt for Red October, when Sean Connery’s character Captain Marko Ramius asked for “1 ping and 1 ping only." The ship is 134 meters long, and we have over 250 crew members, from cooks to engineers to technicians to operators to medical staff. Everyone onboard is trained to fight fires and floods, as it’s a little hard to try and call 911 and ask for assistance when the ship is in the middle of the ocean. The ship operates 24/7, so we must be able to respond to any emergency day or night. If, at 3am, the alarm goes off everyone has to get up, dressed, into assigned positions throughout the ship, and we must have people advancing on the fire within 6 minutes. HMCS Winnipeg deployed on June 15, 2015 from Victoria BC, and we are expecting to return home around the end of February 2016. This ship is part of Standing NATO Maritime Group 2, which is a task group consisting of the German frigate FGS Hamburg, the Canadian frigate HMCS Winnipeg, the Spanish frigate ESPS Santa Maria, the Spanish supply ship ESPS Cantabria, the Italian frigate ITS Bersagliere, and the USA destroyer USS Donald Cook. HMCS Winnipeg is operating in support of NATO operation Active Endeavour in the Mediterranean Sea in order to deter, defend, disrupt and protect against terrorism and terrorist support activities. Temperatures average around 33 degrees Celsius every day with 75% humidity. Sometimes the only daylight I see is when I am out on the upper decks of the ship working out. 12:30am – to bed, then repeat is all again the next day. There are days when your off watch time is filled with work do to a secondary duty you may have such as Ship’s Team Diver or Naval Boarding Party. This means some days its over 18 hours before your head hits the pillow. Being in the Navy has offered me so many opportunities than I would have had in the civilian world. I have travelled down to South America, been to Hawaii 5 times, through the Panama Canal 3 times and around the Mediterranean Sea twice. I have been hanging 50ft below a helicopter and helped fight a fire onboard. Being in the military also allows people the opportunity to look at and take different courses and career paths. The next challenge I am looking at is becoming a Shipboard Air Traffic Controller (SAC). That means I would be monitoring and directing the ship’s helicopter and any others that come out to play with the ship. 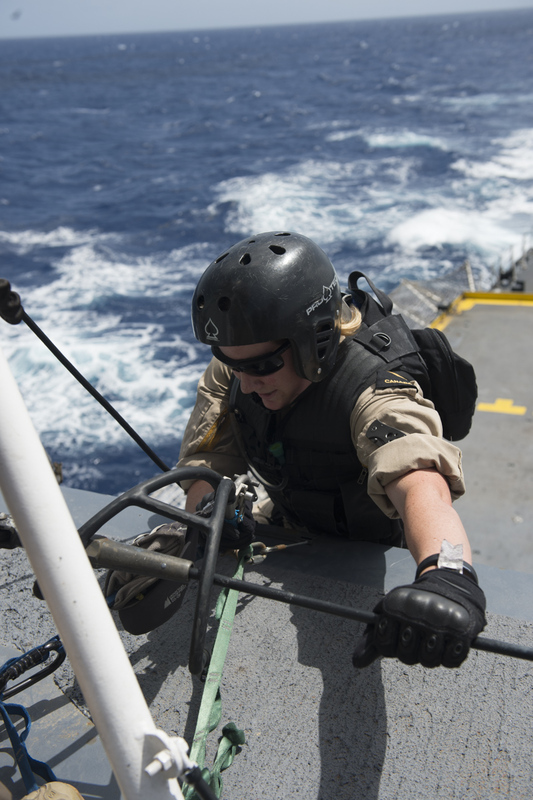 Challenges do come with being in the Navy and especially with being deployed for a long time. My bed space is only 2 feet high, 3 feet wide and 6 feet long. I live out a the locker that keeps of all my uniforms and any personal items. Sailors are away from family and friends for birthdays, anniversaries, and holidays. We also depend on those left back home to take care of any problems. Navy deployments might not always have military members right in the middle of a live battle where we are being shot at but it can still be dangerous and stressful. While I miss my family and friends, I miss these two things most of all: taking long hot showers and baths and cuddling with my cat, Abby. I hope you enjoyed hearing about what life is like for someone deployed in the Canadian Navy. If you know of any Canadian military service members currently on deployment, you can send them parcels and letters for the holidays free of charge though Canada Post until January.